The City of Gary, Lake County, Indiana has selected Meridian Hospitality Group, LLC as the Master Developer of choice marking a major step for the City of Gary toward breathing life into one of America’s most economically distressed cities. December 2016: Gary Redevelopment solicited for Developers through a bidding process. Across the country, Developers place bids to five of Gary’s Master Plan districts that the city targets for redevelopment. April 2017 – Developers presented their concepts hosted by the Redevelopment Commission and the Gary Economic Development Corporation. Meridian Hospitality Group has successfully gone through the bidding process. September 2017 – AWARDED – Meridian Hospitality Group is thankful to be awarded the Master Developer status and proud to serve the City of Gary. Meridian Hospitality Group receives the Master Developer Agreement for three (3) major development areas in the City of Gary, Lake County, Indiana. AWARDED MASTER DEVELOPER – Bid and Presentation Concept Rendering / 90+acres. Master Developer Meridian Hospitality Group. Copyright © 2016-2019 Meridian Hospitality Group. All Rights Reserved. Permission must be obtained to use this image. Gary, Indiana, is one of the most economically depressed cities in the country. One in every three city residents live below the poverty line, more than double the national poverty rate of 14.0%. For more than 50 years, the city of Gary, Indiana, has suffered the effects of extreme deindustrialization and disinvestment. These economic and political changes have left the city with few resources to meet the needs of its residents. Redevelopment in the City of Gary will be a catalyst for additional economic development while providing much-needed employment opportunities. These are exciting times for the City of Gary and Northwest Indiana… We and our Investors are proud to be a part of the experience in creating a national model for redevelopment. The Meridian Team looks forward to contributing to the Development and Redevelopment efforts of the City in growing and promoting a NewGary. 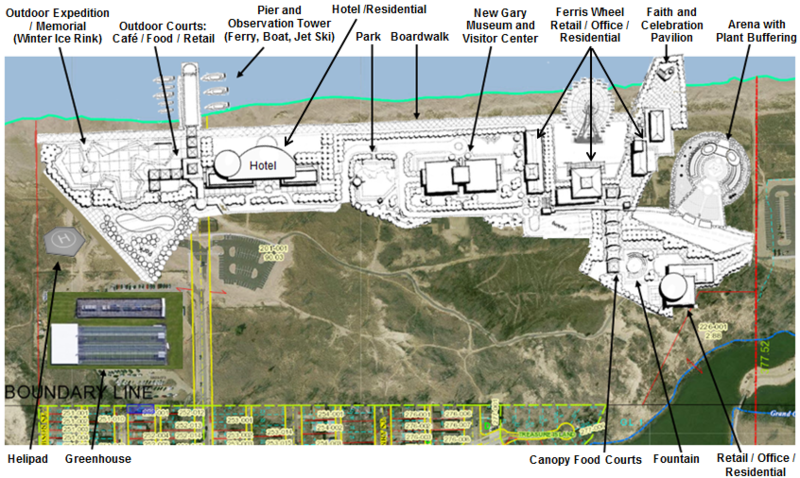 NewGary NW Indiana Waterfront Redevelopment – This targeted 90+-acre area for master redevelopment is Lake Street Beach located on the southern shore of Lake Michigan adjacent to Marquette Park and Majestic Star Casino in Gary, Lake County, Indiana. The project is being developed as a mixed-use community development much like the National Harbor but on a smaller scale. Observation Wheel: They say the “Pleasure wheels” were invented in the 17th century somewhere in Bulgaria, although there are manuscripts proving their early presence also in Constantinople, Romania, Siberia, India, and England. One of the icon elements of the development is the Observation Wheel. Wheels are seen as a way to create a defining element for destination projects. Observation wheels keep tourists engaged with the city. Water, beach, sand dunes and the City – These four elements together make an ideal location for an observation wheel. Big Wheels are slowly being replaced from amusement parks because they’re considered to be too tame by the thrill seekers who flock to Kings Island and other similar locations. 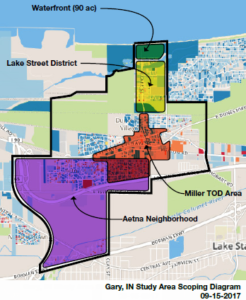 Lake Street Junction Area and Miller Transportation Oriented Development (TOD) – The Miller Station and District development is two-folded, to reinforce the Gary Lakefront location and to provide easy access to the lake and throughout the plan and neighborhood. Aetna and Glen Ryan Community – MHG will employ elements of Gary’s Redevelopment Commission studies that include Housing Design, Build Programming Solutions that are both workforce affordable and market value-oriented. Meridian Hospitality and Development supports this undertaking and believes that all of the requisite elements are in place to facilitate success.